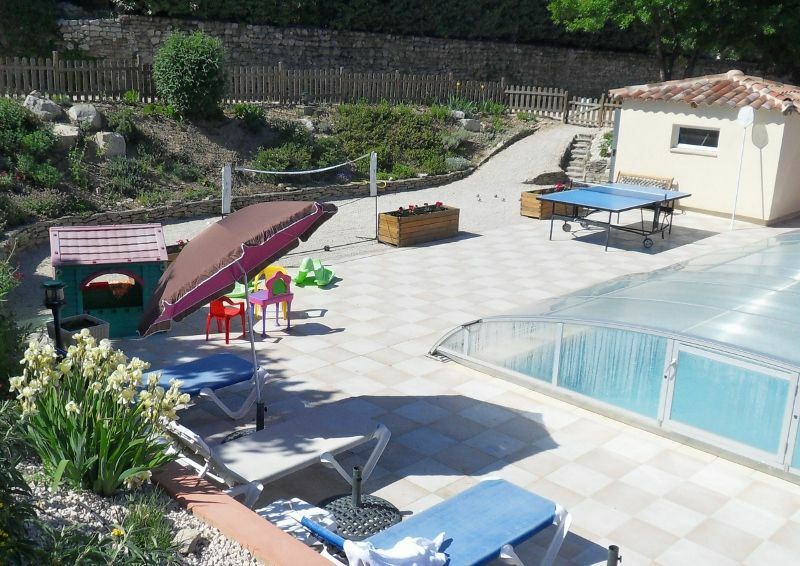 Four houses in a holiday residence, very quiet, ideally located for sporting holidays with the family or with a group of friends (biking, climbing, hiking,) or cultural (Vaison la Romaine and its excavations, or the dance festival, Avignon and it festival, and Orange and its Chorégies). Total bed capacity: 20 to 26 people. The common pool is heated and covered. WiFi throughout the site. Common room with ping-pong and table football. The house called the “tree house” is built in the tops of the oak trees, hence the name! To the bottom there are four independent houses. The enclosed property of Rabassiers is located in the countryside, out from the major roads so you can enjoy exceptional tranquillity. Additional amenities: hair dryer, iron, sewing kit, deck chairs, clothesline, and staff. Attention: The schedule shows all 5 houses as full only when they are all occupied. On the contrary we have improved our services with a bike shed, covered swimming pool, a movable roof for the entire pool, heat pump (the pool’s temperature is of 27 deg. And soon to be opened), landscaped garden. We do cut off prices according to every period: -5% on the second week, -10% on the third week, and -20% on the fourth week of rental. Exceptional location for: cycling, climbing, hiking. Intense cultural activities: Roman excavations at Vaison la Romaine, dance festival; International Triennial Choralies, Uptown theatre in Vaison la Romaine. Summer events in every village. In the surrounding area: exceptional location for cycling, the awarded Vaison la Romaine, Theatre of 2M at Puyméras, uptown theatre in Vaison la Romaine. Summer events in all the villages. Cycling: mountain, middle mountain, and lowlands. All tastes are satisfied. Gerard: retired professional in general medicine after working for 40 years in Vaison la Romaine, I am devoted exclusively to my guests. My passions are fly-fishing, billiards, bridge, bowls, and the economy. Nicole: professor of Greek, Latin and French, a former tour guide of historic monuments. I have explored Vaison la Romaine like the tourists for 15 years. My passions: archaeology, cooking, and ballroom dancing. Nicole and Gerard built this holiday centre to share the diversity of the region with their guests. Heated pool. Covered pool with mobile cover on a rail, easy to open. WiFi. Calm and soothing. Family residence for up to 22 to 24 people Game room with ping-pong and football table as well as board games In low season you will be able to enjoy the swimming pool that is covered (sliding cover) and heated. During high season you can enjoy the shade of the truffle oaks (Rabasse is truffle in Provencal). Both of the terraces at each house allow you to “follow” the sun. Separate toilet. A shower. Simple and comfortable. Good ventilation and natural light: window in the toilet and the bathroom. Two terraces, one to the east and the other one shaded and to the west. Heated covered pool (5-10) for swimming from April to October. The shelter is completely removable for hot season. There is a ping-pong table, badminton net and bowls. There are tennis and badminton rackets available in the house. 2 large terraces to the east and to the south, which communicate through large windows with the lounge so you can “follow the sun”, and be comfortable if you have young children (cycling or rollerblading possible for a young child). Un grand merci pour votre accueil, votre partage. Nous avons passé un excellent séjour où tout est fait pour qu il se passe ainsi !!! Merci beaucoup Floriane. Nous sommes heureux de savoir que vous avez passé d'excellentes vacances. Votre commentaire nous conforte dans notre désir de bien faire. A bientôt sans doute ? Top pour des vacances entre amis sans oublier les enfants. Endroit idéal pour passez des vacances sportives ou pas! Belle et grande piscine chauffée, propriétaires super sympas. Bref nous y retournerons très certainement l'année prochaine. Die Anlage ist in einem sehr guten, gepflegten Zustand und wirklich ruhig gelegen. Die Vermieter sind sehr nett und hilfsbereit. Im Haus ist alles vorhanden, was man braucht. Der große Pool hat unseren Kindern sehr gefallen und Tischkicker und Tischtennis im Aufenthaltsraum haben wir auch genutzt. Die Lage ist ideal zum Radfahren oder Wandern in den Dentelles de Montmirail oder am Mont Ventoux. Die Ouvèze lädt auch zum Baden ein. In einigen Minuten ist der Fluss zu Fuß zu erreichen. Eine sehr schöne Ecke der Provence! Agréable séjour dans cette jolie région, dans cette sympathique maison bien agencée et confortable qui fut un terrain de jeux idéal pour notre petit fils..... Avec une piscine très appréciée et des propriétaires charmants qui nous ont donné envie de revenir. Nous avons passé de très bonnes vacances dans cette location très bien conçue et confortable. Un grand merci à Gérard et Nicole, deux personnages hauts en couleur et particulièrement sympathiques, pour leur accueil très chaleureux et leurs conseils avisés sur la région et les bonnes adresses de restos... Nous reviendrons sûrement pour profiter à nouveau de cette superbe région. Laurence, Aurore et Bernard de ch'nord! Nous avons passé un excellent séjour dans cette magnifique location où tout y est: le confort, la superbe piscine et des charmants propriétaires, très accueillants et plein de sympathie et de bienveillance envers leurs vacanciers. Encore un grand Merci à Nicole et Gérard. La région est vraiment splendide et nombreuses sont les activités à faire, avant ou après un bon 'farniente' à la piscine. Merci pour votre sympathique appréciation. Nous savons que vous avez profité au maximum de nos suggestions de sortie. Nous serons très heureux de vous revoir. The place is ideally located for practicing activities like cycling and climbing. Mount Ventoux is at 7km. And all the other average mountains are around such as: Col de Fontaube, Col Dey, Col de la Peronniére etc., with a landscape at every step, always changing and of rare beauty. This area is also perfect for climbing: there is a 3000 metres cliff at the edge of Ouvèze, Montmirail is at 15 km, the Buis les Baronnies climbing centre is at 20 km, and at 10 km is the world famous St Leger. You must explore Vaison la Romaine: with its Roman relics, an important cultural and vibrant city with nice shops. Avignon is at 45 km, the Camargue and the sea are not very far. From Entrechaux you can go to either the Provencal Drome or to the Comtat Venaissin, or to the sea.